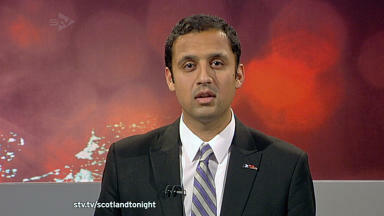 Anas Sarwar, 30, was alleged to have been spotted driving and holding his phone up to his ear. The deputy leader of Scottish Labour has been cleared of using his mobile phone while driving. Anas Sarwar, 30, was alleged to have been spotted driving along Glasgow's Scotland Street after leaving his office and holding his phone up to his ear. Officers claimed they saw Sarwar while driving towards him on January 17. Sarwar, from Pollokshields, Glasgow, denied the allegation and told Glasgow's Justice of the Peace Court his phone rang and that he pulled into a lay-by before answering it. Justice of the Peace John Lawless ruled that there was an "insufficiency of corroborative evidence" and returned a not proven verdict. The court heard from PC Elaine Turner who was in a public order van with two colleagues at the time of the alleged incident. PC Turner claimed she saw Sarwar, the driver of a red Honda Civic car, driving towards their van. Asked if she noticed anything about the driver she said: "He had a mobile phone in his right hand at his right ear." The constable said her colleague who was driving turned the police van around and they went to speak to Sarwar, who had pulled into a lay-by. PC Turner said that Sarwar was asked for his details and was cautioned and charged. The court heard he replied: "I believe I pulled over the vehicle before using the phone". In evidence Sarwar told the court that he had left work and was driving back to his house when his phone rang. He said it was in a pocket in the door of the car and that he did not answer it until he had pulled over. He told defence lawyer Michael Lyon: "I definitely pulled in to the lay-by before taking that call." It was suggested to him by procurator fiscal depute Derek Buchanan that he knew he was caught and did not want to accept it. Sarwar told him: "I'm giving an honest account of what happened."